The independent transport videos cameras have returned to Edinburgh to update the bus scene in the Capital city of Scotland. Quite a lot has changed since our last programme which was filmed in 2008/9. The Lothian Buses fleet is now 100% low floor and the harlequin livery is now being replaced by a stylised version of the madder and white scheme which now features the fashionable curves of the day. The presence of Firstbus is diminished in our 2012 footage as the services are being replaced by ‘East Lothian Buses’ a new subsidiary of the parent fleet in an all over white livery, but a good variety of Firstbus vehicles appear on our 2011 filming. Also new to Lothian Buses are a fleet of Alexander Dennis Enviro 400 Hybrid buses in a smart variation of the standard livery, where a Champagne gold colour is substituted for the white. We start our programme on Princes Street in August 2011. There is plenty of action for you to enjoy as we film in many locations along this busy thoroughfare before moving to The Mound and Frederick Street for further shots. Our 2012 footage also starts in Princes Street, offering an interesting comparison with the previous years filming. We then take a ride on one of the new Alexander Dennis Enviro 400H vehicles. We join 204 (LB61 BUS) in St. David Street for a journey to Western Harbour on service 10. An interesting ride through the streets passing similar vehicles on the same route as well as many other types. From Western Harbour we return to Princes Street onboard similar bus 211 (SN61 BBX), this time travelling on the lower deck, taking in the sights and sounds of the journey. With more footage being shot on Princes Street and St. David Street our filming then concludes on North Bridge as the sun starts to set on this beautiful city full of interesting buses. 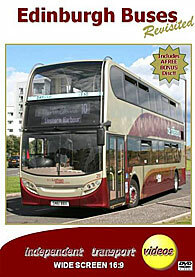 We also include a ‘Bonus Disc’ that features archive film from the 1960’s of Corporation buses running alongside various Scottish Bus Group buses and coaches. Also video footage from the late 1980’s and early 1990’s of Lothian Buses in service as well as some interesting visiting buses to the streets of Edinburgh. We are sure you will enjoy these fascinating scenes from a bygone age! Duration : 83 minutes (approx).